As a marketer, organization is crucial. With each campaign having many moving parts, keeping everything in order can be a full-time job. Luckily, HubSpot just launched a great new tool, designed to help marketers with this very issue. HubSpot’s new Calendar Application has been built to give marketers a “home base” for all things marketing, both in the long-term and short term. This intuitively-designed tool is setup to aid in both the planning and execution of inbound campaigns. 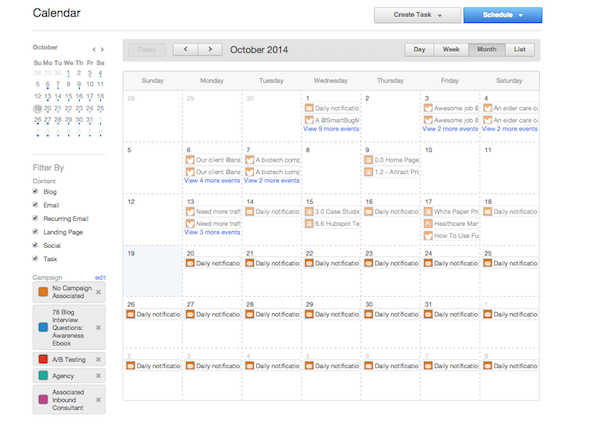 Like all HubSpot features, the Calendar is very easy to use. When logging in, it very much resembles other online calendars used daily, such as Google Calendar our Outlook. This application will populate events associated with other scheduled actions within the software. For example, if there are blog articles scheduled to be published, or social campaigns teed up, those will be seen on this calendar. In addition, you can click into each scheduled item, to see the details and a preview for further information. Another great feature is the ability to filter by either content type or campaigns. This is particularly helpful to get a 10,000-foot view of a campaign coming up, or to see which social posts are pending. In addition to seeing actions that have already been scheduled, the Calendar app allows you to schedule new actions that are currently saved as drafts, thus showing the marketer what is already scheduled for that date, before taking it live. Not only is this new tool extremely user-friendly, there are many practical uses that can take any marketing team to the next level. Until now, many of us were using a hybrid of tools to keep all marketing activities in order. A combination of online calendars, spiral notebooks and whiteboards usually top this list. Now, all marketing efforts can be categorized into one central place. 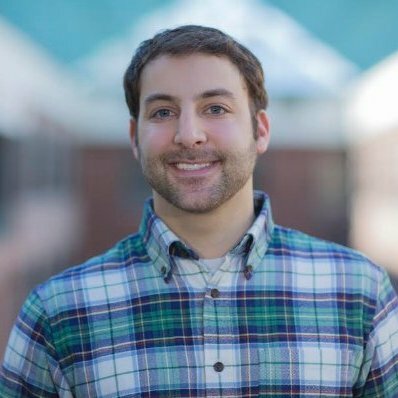 Not only will it show other HubSpot tools that have pending actions, but any offline marketing activites can be added here as well. This is extremely useful for tradeshow events, direct mail sends, press releases, and webinars, all of which tend to coincide with each other. For those of us who spend our time working on many projects at once, tasks can be set for certain deadlines and reminders so that nothing falls through the cracks, and everything gets published on time. Another helpful addition is the ability to schedule actions into the future. Although this is available in the individual content tools, switching between them can be time consuming. Being able to bulk schedule a variety of tasks saves any marketer valuable time. As marketing teams evolve, responsibility can be delegated across members. Keeping projects on schedule while collaborating as a team requires increased communication. HubSpot’s new calendar tool helps in this regard. When creating tasks to be completed, these actions can be directly assigned to other members of the team. These tasks can have a specific due date and time, and custom notes on the assignment, so that nothing is lost in translation. Furthermore, a notification is sent to the assignee, letting him or her know there is another task to complete. When taking a project management view, it’s important that the team is working towards the same goals. Being able to directly-assign marketing actions through this calendar gives the Head of Marketing an in-depth view both at an individual and overall team view. As important as it is to see what’s happening in the future with your marketing efforts, it’s equally as important to look back on past campaigns. Although the Calendar tool is new, it is populated retroactively with past marketing actions. When doing monthly or quarterly reporting, it might be interesting to look back and see what happened on a particular day, or events that lead up to a particular spike in traffic. In addition, if there was a successful campaign run in the past, you can gain some great insight by looking back on what promotion was done at that time. There are other tools in the platform that can help in this respect, such as marketing events in the Sources tool, or event-based reporting, however this method allows you to see these marketing actions side by side. HubSpot’s Calendar is a welcomed addition to any marketer’s toolkit. Not only does it keep you and your team organized, but it provides helpful data to push your upcoming campaigns forward. Be sure to stay tuned to all the exciting new additions HubSpot has added to their platform this summer!